Schools in south to remain closed as rocket attacks continue. Following an assessment Sunday evening by top defense officials, it was decided to keep schools in Israel’s south closed on Monday. The decision applies to all schools and daycare centers located between 7 and 40 kilometers of Gaza. Schools will be open in the Beit Govrin, Galon and Shomriya regions. In addition, schools will be open in towns located 0-7 kilometers from Gaza. 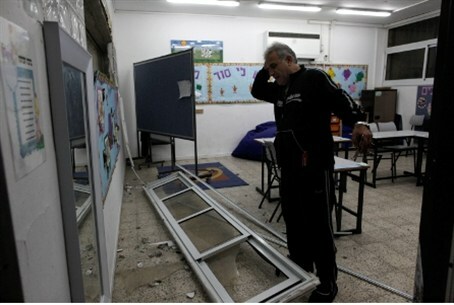 Sapir college in Sderot will be open Monday despite attacks. However, teachers will not be taking attendance. Shopping centers are to remain open. However, the Homefront Command has prohibited gatherings of 500 or more people within 40 kilometers of Gaza, whether inside or outside. A silent radio channel will be operating during the day. The channel will air nothing but rocket alert sirens. In Be’er Sheva the silent channel will be 95.8 FM, in Ashkelon, 97 FM, and in Ashdod, 101.5 FM. The decision to close schools follows two days of continuous terror attacks from Gaza. Defense Minister Ehud Barak warned Sunday that the attacks may continue for several days.